As the Global Network reports, "The US arsenal of hypocrisy is poised for another launch from Vandenberg AFB in Southern California in the early morning hours of August 23. Our government lectures and threatens Iran and North Korea about the evils of nuclear weapons and then arrogantly continues to fire nuclear missiles from California into the Pacific Ocean. 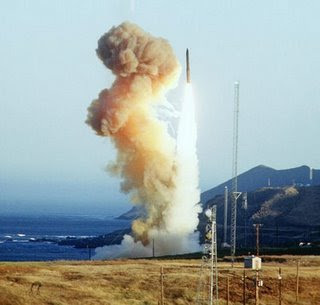 On August 23rd there will be another 'test firing' of a Minuteman III nuclear missile from Vandenberg." Woodstock's Ametek Rotron supplied parts for the Minuteman from the 1960s on, was still doing so in 2001, and most likely has continued to do so. So Woodstock is contributing, in its small way, to the nuclear destabilisation of the Earth. Vandenberg Witness is calling for protests against these missile tests on August 22/23. A previous test firing of Minuteman ICBM from Vandenberg is pictured here.